What impact did the European directives on water and nature have on spatial planning? Is it possible to have an integrated approach to the implementation of the directives? These are some of the issues discussed during a seminar held in Rome on July 6, 2016 with the collaboration of Comunità Ambiente, the association Gruppo 183, the Lombardy Region and with the support of the European Commission. Speakers at the event included, among others, representatives of the European Commission, of the Ministry of the Environment Land and Sea (MATTM), of the Institute for Environmental Protection and Research (ISPRA), the Regions implementing integrated projects, the Basin Authorities, universities, environmental NGOs, trade unions, private companies that offer services in these areas, and experts from various parts of Italy. The following paragraphs offer a brief summary of the interventions and the links to watch the videos. The objective of the workshop is introduced by Michele Zazzi, of the University of Parma, coordinator of the Gruppo183 onlus and Fabio Attorre, of the University of Rome La Sapienza. Zazzi that when it was founded by Giuseppe Gavioli, the association had as its purpose the implementation of the Italian law 183, on the improvement of water and soil conservation. “Although the law 183 is no longer there, incorporated in the so-called Consolidated Environment Act,” said Zazzi “That interest has always remained unchanged, even today, when those issues have become a matter of debate within the daily communication, and tools of mass communication. We have achieved a goal, the European Union first and Italy afterwards, addressing successfully sectoral issues: now it is important now to take another step towards the integration of policies, instruments and actions”. “There is a feeling,” says Zazzi in a second brief intervention “that in recent years the production capacity of knowledge, of relationships and sometimes of concrete actions on the ground and thus also that of the European and Italian competent authorities, has greatly increased. Our organization was born to implement the law 183, which was not implemented. But today there many things are being produced of considerable technical and scientific complexity, which are not easy to deal with. And this reality changes the need for action by environmental groups. Today together with advances in the scientific community, which must be systematic, and of public administrations, there must be a parallel process of establishing a strong collaboration with the variously organized and represented society. It is the synthesis of these two contributions that we ensure that the status of habitats can really improve. It is otherwise difficult to understand why having a detailed knowledge of habitats their condition continues to deteriorate. Obviously we have not reached the goal we had set ourself, but only an initial stage and environmental groups have to contribute to move forward. 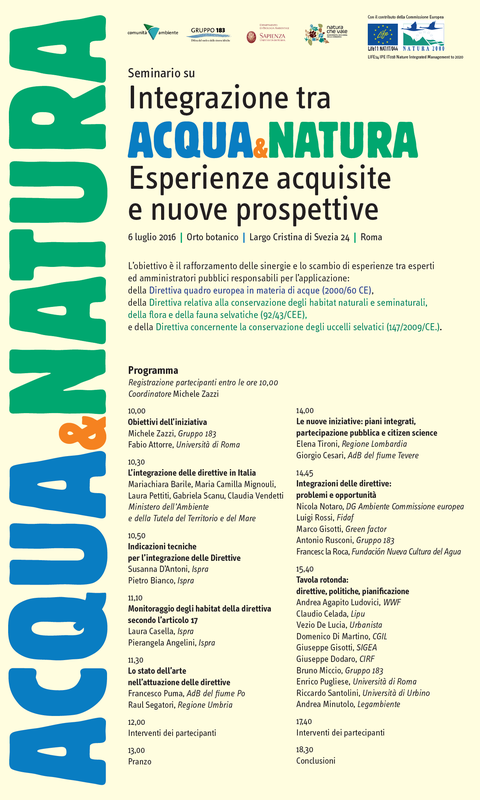 The integration of the Water Framework Directive and the Birds and Habitats Directives, and in general of environmental policies, is essential, according to Fabio Attorre, form the University of Roma-La Sapienza, who intervened after Zazzi, “because without integration environmental measures are less effective and the sector is not taken much into consideration, especially at a time of economic crisis. “If they cut resources, they cut on the environment, also because we are unable to quantify precisely the state of conservation of habitats and biodiversity and the reference values to use to measure the effectiveness of measures”. To be incisive the water and nature directives must have an impact also in social and economic terms. “In the environmental field everything is interconnected,” says Gabriela Scanu, from the Technical Secretariat of MATTM who illustrates the work done to date on these issues by the Directorates General for the Protection of the territory and water (STA) and for the protection of nature and the sea (PNM). Scanu informs that in order to promote a greater connection between the various offices with a competence on water and nature and to encourage integration between the water and nature policy, the ministry has decided to establish a working group with representatives of STA, PNM, the technical secretariat, the department for protection of nature and the marine strategy , and a large group of experts, who worked at a document relative to the management plans of the directives. The document is open to comments and suggestions. Irene di Girolamo, technical and scientific responsible for the protection of the Sea unit of MATTM reminds the audience that the Ministry has been working for years on the European strategy for the marine environment, a directive adopted in Italy in 2010, which includes everything related to marine areas and what comes from fresh water to the sea, in application of the Water Framework Directive and everything related to marine species of transition waters,in application of the Habitats Directive. The aim of the Marine Strategy Directive is to achieve by 2020 a good environmental status for marine water and Italy is moving in that direction. By 2015 Italy had defined all the monitoring programs. Currently the Ministry is working on monitoring of coastal waters and national marine protected areas. The work will furnish a framework- even though only a background framework, because there are very little data on marine environments-to define within a few months the governance programs for the protection of marine areas. Laura Casella from ISPRA, focuses on the main aspects of monitoring in accordance with Article 17 of the Habitats directive. The Italian Ministry for the Environment has been engaged in the preparation of a manual for monitoring of species and habitats at a national level so as to allow Italian Regions and Autonomous Provinces to create a collection of harmonized data by means of standardized technical protocols and in order to facilitate consistent assessments reports. The preparation of the document was coordinated by ISPRA, with the support of the main Italian scientific societies and in close collaboration with the Regions and Autonomous Provinces. The manual will be presented in October 2016, even though there are still some open issues (eg estimate of favorable reference values VRF) under discussion at the European level. Susanna D’Antoni from ISPRA reminds the audience that the WFD requires integration, in particular with Articles 4.1c, 8.1, 11, according to the principle that the management of water bodies must be based on an ecosystem approach. Integration is a complex process but useful because it involves several advantages: optimizing the use of available data, increase of knowledge, evaluation of the scale at which to intervene, assessment of the effectiveness of measures in order to optimize costs. ISPRA has worked for several years on these issues and, thanks to the work done within the technical committee dedicated to wetlands, it has produced two documents: the report 107/2010 on the synergy between the three EU directives- Birds, Habitats and Water- and an analysis of integration of planning tools, together with a list of habitats and species linked to aquatic environments; report 153/2011 on the contributions to the protection of biodiversity , which includes a description of the status and distribution of wetlands. For the integration of conservation objectives it is important to refer to the lists of species and aquatic habitats, to the monitor data of the state of conservation of species and habitats, to the data on the pressures and impacts on ecosystem services of water bodies, including the effects of plant protection products. Since 2009 ISPRA has been involved in a pilot project in the Nazzano-Tevere Farfa Natural Reserve aiming at implementing the integration of the three EU Directives. The work carried out until now shows that all WFD indicators produce information useful to assess the state of habitats and aquatic species and that the information derived from the monitoring of macrophytes is also useful to the assessment of the state of the Natura 2000 habitats. Francesc La Roca, from the Fundación Nueva Cultura del Agua (FNCA) describes the experience of the Observatory of the water policy as a laboratory of co-production of knowledge and citizen participation in Spain. The elements of change in water policy in Spain are due to a number of factors including environmental concerns, local opposition to large water projects and to how costs are distributed, consequences of the 91-94 drought; restrictions imposed on urban water supply and leaks in the water network. The alliance between academia and social movements has produced three main moments of synthesis: in 1998 in Zaragoza with the First Iberian Conference on planning and water management, the 2000 Porto Second Conference with a transnational approach and Zaragoza in 2001 with the formal constitution of the Foundation for a New Water Culture (a network of researchers, activists and academics that contribute to a comprehensive approach to the co-production of solutions). It also provides a master’s degree in sustainable river management. According to the observatory of water policies there is a need of profound changes of management models. The main results of the activity carried out included : the actual interdisciplinary work of evaluation of watershed plans; improving the quality and access to information on planning / water management (computerization); the development of city networks through coordination and creation of new social skills; the creation of alternative resolutions forums with professionals and city networks. Success has been however been limited. The absence of formal participation in the planning processes and the lack of debate on conflicting issues are two of the main causes of the limited success. Participants to the planning activity seem to be frustrated and do not trust water authorities that have not taken a parallel step forward. Francesco Puma, secretary of the of the Po River basin authority, starts by stating that the intervention of La Roca included a number of problems that are also present in Italy. Italy, like Spain, is a land of ancient water uses that still have an impact on the possibility of changing uses and allocations. The difference between Italian and European planning is that the former tends to include as much as possible while the latter is strategic. EU planning identifies critical issues and priorities and calls for the implementation of a continuous monitoring process within a continuous planning process, with deadlines and an efficiency and effectiveness analysis. Puma then lists the main objectives for the Po river basin. They include the reduction of flood risks, increased water availability, groundwater recharge, improved water quality, increased water treatment capacity, recovery of habitats and better fruition opportunities. What the Directive requires, according to Puma, is a new intervention model. The model should encompass the territory as a strategic space in which it is possible to reconcile the objectives of cohesion, social equity, competitiveness, development, protection and enhancement of local resources; the right balance among economy, ecology and society; the use of a language that is accessible and understandable to explain the objectives and strategies to citizens; a greater simplicity and accessibility to decision-making through better information on the activities of the institutions. Together with a systematic dialogue with representatives of the various authorities and organized civil society; an assumption of responsibility by each administration in relation to the development and implementation of policies; effectiveness and timeliness in producing the required results on the basis of clear objectives, the reduction of their negative impacts, and if possible, the awareness of experiences gained in the past. The secretary general of the Po River basin then listed a number of recommendations to face future challenges: not to start all over again, with a return to a hierarchical system that has never worked, but do leave some functions and responsibilities at national level; move from a comprehensive master plan with indefinite timing to a six-year strategic plan, with precise cycles; promote the transition from: a virtual to a real plan; from an administrative monitoring of efficiency to a technical monitoring of effectiveness of measures: from sectoral technical facilities to integrated interdisciplinary structures; from basin government to district governance; from an emergency intervention policy to a routine prevention policy. Elena Tironi, of the Lombardy Region, presented the Integrated Project co-funded by the European Union through the LIFE + financial instrument (IP GESTIRE LIFE Nature 2020 Integrated Management) which aims at an integrated management of the regional Natura 2000 network, based on the priorities identified by the completed framework of priority actions (PAF). A long-term, ambitious and innovative project, that in addition to the LIFE resources intends to activate other European, national and private funding, for a total amount of € 80 million. Tironi sets out the main contents of the project, highlighting the integration aspects of the conservation of habitats and species of Community interest with the management of water resources. Some of the most exemplary actions include: the integration of the skills of staff in charge of the management of water bodies with expertise of the needs of habitat and species linked to aquatic environments; formulation within the river contracts of governance models for Natura 2000 sites; restoration of ecological connectivity through the re-naturalization of river corridors and irrigation network; management of water bodies taking into consideration the presence of wetland birds and amphibians; definition of an evaluation methodology of the minimum outflow of rivers suitable for the conservation of species and habitats of community interest. Raul Segatori, of the Umbria Region, illustrates the state of the implementation of the Habitats Directive and the Natura 2000 network in Umbria. In 2013, approximately 20 years after the so-called LIFE Bioitaly project, the region can count on Management Plans for all 102 Natura 2000 sites, the designationof almost all the pSCIs into SACs (the Environment Ministry is currently working on the designation of the last SACS). The Umbria region is now working on the PAF (Framework of Priority Actions Framework). The PAF identifies wetlands, which Umbria is particularly rich in, as one of the priorities for the protection of the Natura 2000 network. 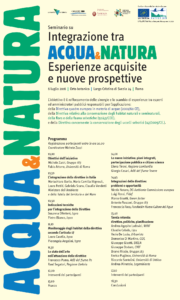 The regional ecological network (RERU), of which Natura 2000 is an integral part, considers water courses as the most important ecological corridors,also in relation to the fact that ththe Umbria regional area represented 90% of the Tiber river basin. A recent study has shown that soil consumption within the Umbria Natura 2000 network is considerably lower than outside the boundaries of the European ecological network. Nicola Notaro, of the EC Environment directorate, head of the unit that manages the habitats and birds directives and with a previous experience at the WATER unit informs that at European level there is an ongoing collaborative process that seeks to bring those who work for the implementation of the water framework directive and those who work for the implementation of the Habitats and Birds Directives: a process launched some years ago during the Lithuanian Presidency of the European Union. Since then there have been a number of meetings of directors and heads of administrations of EU Member States and the EC directorates dealing with nature, water and sea protection. The most recent meeting took place in 2015, when the directors of ministries that deal with nature, water, and protection of the sea, within EU Member States, have agreed on a joint declaration focusing on three main points: bringing closer the cycles and content of national reports to the EC. The second aspect is linked to the common interest in the application of these directives within the context of other policies and the consequent need to create a joint dialogue with colleagues who work in other areas, i.e. in the agriculture and fisheries sectors, especially in relation to the distribution of EU funding. The third element is a practical tool, a kind of guide for beginners, to communicate basic knowledge of the three Directives and the marine strategy. Marco Gisotti, of the Green Factor company, dedicates his speech to the presentation of the results of a study on employment produced within the Natura 2000 areas: a state of the art of the so-called “Green jobs” and the type of skills required by the management of protected areas. The numbers of those employed in the nature protection sector is significant: over 60% of the new workforce. These trends within protected areas are not different from those outside. Often the growth in the sector is not accompanied by public measures: the ability of private enterprises is autonomous and the confrontation with the market results in the developement of a more sustainable method of production. Some studies have linked the amount of money invested in biodiversity with the number of new jobs: an investment of 33 000 euro generates one new job on a permanent basis; every million euro invested generates 1,700 directly related new jobs, 280 jobs indirectly related and 930 new linked employment. More generally, it is estimated that with a billion Euros could generate about 30,000 new jobs in the biodiversity sector. More than one source claim that 40 billion euro are needed to combat effectively hydrogeological risks (over 5 times the amount set aside for the next 15 years), which would result in between 800,000 and 1,200,000 newly employed people. This data could be used for a more efficient communication. The link between protecting water and nature resources and investments and new employment requires a more incisive communication, which should stress the transversal and interdisciplinary nature of the new occupation. Vezio De Lucia, urban planner, starts his intervention pointing out how the theme of “planning” appears to many as an obsolete,but the confusion that dominates the discussion on the water and nature EU directives, is a direct consequence of the fact that for at least 30 years there has been no true territorial government. Until the mid-80s, all powers were in the hands of the Ministry of Public Works which used the planning law of ’42 and two planning tools: the Territorial Coordination Plan and the Regulatory Plan at the municipal level. From 1972 spatial planning is transferred to the regions. In 1985, started the fragmentation of the territorial government, never recomposed. At first there was first was Law 431/1985 (Galasso) for the protection of the landscape, followed by the 1989 Law 183 to protect the soil, then law 394/91 on the protection of the protected areas. The three laws were made in reference to three different institutional levels (State-Regions / Basin Authority / Park Authority), each with its own planning tool (Landscape plan / Basin /Hydrogeological management plan). What failed, continues De Lucia, was an effective coordination able to moderate the extreme contrasts among laws, plans and codes. This resulted in the spread and proliferation of unauthorized activities and derogations and of a lack of coordination between these sectoral plans with a consequent increase in soil consumption- and the new law will make the problem even more serious. Enrico Pugliese, from the University of Rome, offers a brief historical overview of the evolution of agriculture in Italy, starting from the Serpieri Integral Land Reclamation, during fascism, and to large water projects in southern Italy. Since the end of the Second World War the Italian legislation has defended the small peasant farms and developed the so-called”Green revolution”, which increases the number of farmers from one to nine million. The modernization process suggests that the environment aspect in agriculture should suffer and so it was up to the 1980-90, years in which the environment was not mentioned. Things then change unexpectedly, if terms such as “own consumption” of products or “0km (local products)” which used to express backwardness until shortly before, from a certain point on indicate democracy and progress. The transformation of agriculture in the ecological sense, the consumer becomes the bearer of progressive demands: no GMOs, keeping traditional crops and switching from “cheap food cheap labor”- a mechanization process that in previous decades had replaced 80 % of farmers- with new demands and new problems. Agriculture goes from “the centrality of the land to the centrality of food” with a consequent resumption of small-scale farms and the return to rural life. The new challenges deal with the enlargement of niches and food sovereignty in the global market. The environment is now central in agriculture faculties. And integrated pest management is studied for real. At the end of his talk, Pugliese refers to the experience of “EquoSud Rosarno” which produces organic oranges with a double ecological and social bond. Riccardo Santolini, from the Urbino University, focuses on the rigidity of the administrative approach: it refers to “integration between the water subject and the nature subject” translated into distinct regulations that often do not communicate due to the fact that not all competent professional approach planning taking into consideration the complexity of natural phenomena. The monodisciplinary approach has produced the current difficulty in developing synergies, required by the EU but by the materiality of our present. We talk about resilience and the difficulty of the natural environment to restore conditions of equilibrium because we are used to interpret as permanent dynamic objects that evolve under the pressure of specific drivers. We do not need environmental or engineering consultants, but a more comprehensive effort by universities to form new professional awareness of the importance of the functional aspect of ecosystems, also in order to measure the functional and economic value of our actions as EU integrated projects are doing. Andrea Agapito Ludovici, from WWF, points out that articole 13 of the WFD provides public participation according to the three levels: information,consultation, involvement. We therefore have the participation mechanisms , which are adequately addressed. In Italy we encourage participation in planning through the River Contracts. The fact is that in Italy there are many efforts to see the connections between the different directives, but the challange we are facing is more than that: it has to do with the fact there has not been any planning at all in the last 20 years and now we have to invent a new governance to meet the challenges, relaunched also by the Paris Conference (adaptation to climate changes, starting with the water cycle). Some of the critical issues that represent a barrier to coordination can be observed at the level of public offices and of circulation of information, especially on common issues of the different directives (eg. the fish fauna, indicators of the state of water bodies and endemic species). A common sense proposal to overcome these conflicts? Technical and sectoral discussions should be able to produce effects. Andrea Minutolo, of Legambiente, stresses the importance of the role of environmental associations, involved both as stakeholders and as representatives of citizens and the importance of a plan that addresses policies and the various actors involved in the exploitation of the water resources. What is a needed is a cultural change: the integration of the directives should not have an effect only at the academic level but also at the practical, economic, employment, knowledge level. According to the representative of Legambiente it is important to start from monitoring and from the definition of the barriers to the achievement of common objectives in the field of land use and geological risk, together with a greater clarity on responsibilities and controls, the involvement of citizens as required by the EU Directives through the formation of an intermediate level of professionals, with the support of municipal plans. Domenico Di Martino, from the Italian General Confederation of Labour (CGIL) states that his organization represents the needs of both the citizen and the worker, because in the field of “services” the two are not separable. We must link scientific research to the real problems, explains Domenico Di Martino, since many of our laws date back several years ago and Law 152 of 2006 (Environmental Regulations) is not yet completed in its third part. The delays are due to the incompetence in translating norms relating to the protection of nature and water into concrete actions. The CGIL has welcomed the idea of an overall reorganization of the water management plan, but it has still not clear the role of the water districts, the fate of the basin authorities or the rules of the environmental part linked to the 2016 Stability law (Collegato Ambientale). “And when we talk of “Italia Sicura” (“Safe Italy”, the structure of the presidency of the council of Ministers against hydrogeological and other risks), we challange anyone to say what has been achieved until now.” The tools and scientific studies are already available and could have a very positive impact on employment.“Our recipe to meet the challenges of the present consists in training and recovery. This combination of old and the new would useful also l to recover some old vocations that have been lost. “We have indicated”, concludes Di Martino, “our roadmap in the 2013 CGIL Work Plan: in order to have an impact on development there must be a precautionary participation of citizens”. Giuseppe Gisotti, geologist and president of the Italian society of environmental geology (SIGEA) states that certainly one of the central factors of planning is the involvement of the public: among the major problems that you have is the lack of involvement of the public (like in the great works) and the limited diffusion of culture in Italy. The role of associations is essential to bridge this cultural gap. Gisotti ends his speech by recalling how much one can learn from the engineering work carried out in antiquity. Bruno Miccio, of the Gruppo 183, approaches the theme of the round table with a speech fucusing on three concepts: power, money and democracy. Power. A passage has been much debated in Italy- from the 1994 Galli Law to the so-called 2016 Environmental Code- is whether public water should belong to the State. Emblematic in this regard to the “power” theme was an event that marked the “Greek crisis”: one of the diktats of the Troika to Greece was the transfer of all funds of state property to a Luxembourg fund. The issue of money and the economy of the water cycle. Law 129 of 1963 “General Plan for Aqueducts” placed a number of constraints, including a constraint on the use of drinking water and the fact that the concessions granted were to be temporary. What are today the procedures to discuss derivations? Miccio asks the audience. Democracy. For a long time the Gruppo 183 held fast to Europe; the feeling is that times are changing. Participation is not optional any longer; the opposition to the tariff plan (consumer associations appeals) is proof of this. Last point: the never ending problem of Italy’s “capitalism without capitals”. There is a proliferation of plans, but with no coordination, no resources and no consideration of Italy’s real situation. We are now at a turning point: what kind of country are going to build in the next 20 years? Young people should work on what this country really needs especially now, with the end of the illusion that the free market can spontaneously regulate management and exploitation of such scarce resources as water and nature. Osvaldo Locasciulli, ecologist, suggests to start using different criteria for the evaluation of environmental impact by including the economic and ecological criteria fused together. Locasciulli proposes that the Appropriate Assessment should include evaluation criteria assessing the condition of ecosystem services, which would also offer the possibility to start to introduce payment for these services. People need to understand that interventions on nature have an impact on the economy. There are a many concepts that can be communicated but people need to be able to understand. When discussing the problem of bears and wolves, for instance, in the Park of the Gran Sasso, we found ourselves arguing with people who a few months earlier had downloaded with tractors in front of the headquarters of the park dead calves and foals killed by wolves. We managed to make them understand that they are protected, but it was not easy, it was a long difficult process, that must however be followed if we are in a democracy. Dimitar Uzunov, of the Chlora Company, takes the floor on behalf of ecologists, the only category that is not an album, even though the lack of this figure, able to work with these very complex issues, is felt in the labour world. In the exercise of this profession often Uzunov found himself in the absurd situation of having to explain to those who faced him, both public and private, what they wanted from him. But not many know the Habitats Directive. Angelo Martinelli, from ARPA Lazio, focuses on the quantitative aspects, the numbers that are missing when preparing plans in Italy. A fact that prevents completing the plans, in particular the hydrological and water plans. All sizes resulting from human impact are not measured, which means that it is impossible to quantify them adequately. This has an impact on reports to the EC on the implementation of the directives, Water and Habitats, because the assessments given are based on incomplete and inaccurate data.